Typically, for air drying lumber, it takes one year per inch of thickness for the wood to dry to a usable state. In the Southern Maryland region, wood will air dry to approximately 12-14% if properly stacked and sticked. Lumber over 2” thick is difficult to dry, and may develop specific drying defects. It is best to have the lumber stack as level and flat as possible. Variations in the stack will translate to the lumber in the pile, if the stack is not flat, the wood in the pile will dry warped. Stickers should be aligned on top of each other in the stack and be placed 18-24 inches apart. The stack should be well supported with blocks to combat the beams sagging from the weight of the lumber. The bottom of the lumber stack should also be elevated 12-16" off of the ground, to keep weeds and animal impacts to the pile at a minimum. 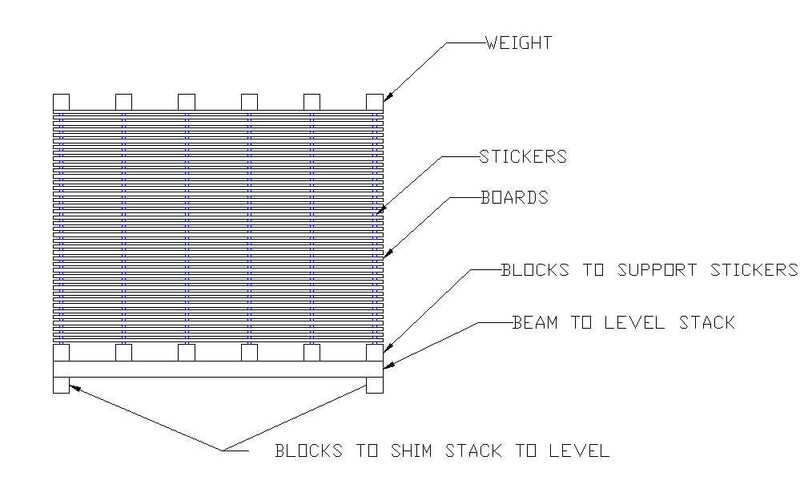 The platform should be constructed as long as the longest lumber is, and stack width is best when 4 to 6 feet wide. The pile should be weighted down and the top covered. Covering the sides of the stack with a tarp will result in moldy lumber. Air must be able to move through the stack. Lumber should be stacked and sticked within 24 hours of being sawn to avoid mold problems. Mold develops quickly during Spring and Summer on pine wood. A light mixture of bleach sprayed on the wood stack helps inhibit mold growth, but mold may still develop if it is warm out. Wood stacks should be left in an open, but shaded area where airflow is not inhibited. Direct Sunlight may cause drying defects. Lumber losses due to material degradation (warp, check, stain, etc.) can be expected while drying. Additional information can be obtained from the USDA Forest Products Laboratory, General Technical Report FPL-GTR-117 .